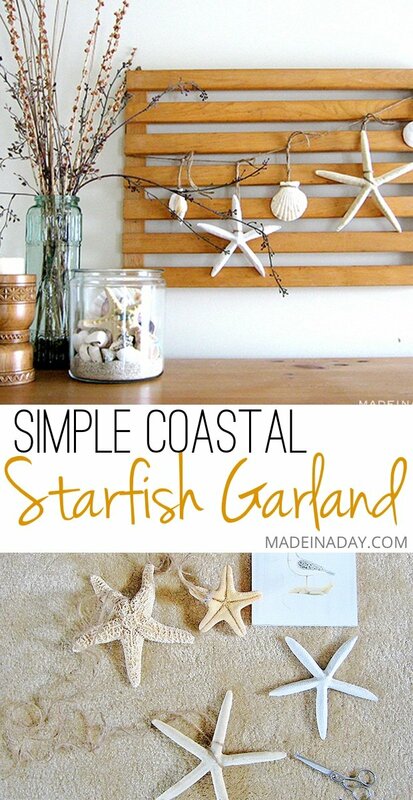 Add a little bit of the coast to your decor with this Starfish Garland Sea Vignette. You can find more projects like this on my Home Decor page. A couple of weeks ago I bought a new comforter set and I just love how that one thing can transform a room into something you never thought of. The comforter is a light teal, with pastel yellow, pink and taupe. It just screamed Key West to me, (or maybe it’s the fact that I am sick of winter and need a vacation.) So I decided to make my bedroom a coastal retreat. What can be more peaceful than that? I found this great reclaimed wood grill type thing, that reminded me of a lobster crate and I just went with it. I made a sweet starfish garland and hung it on the crate wall hanging and voila! I now have a coastal retreat right in my bedroom! 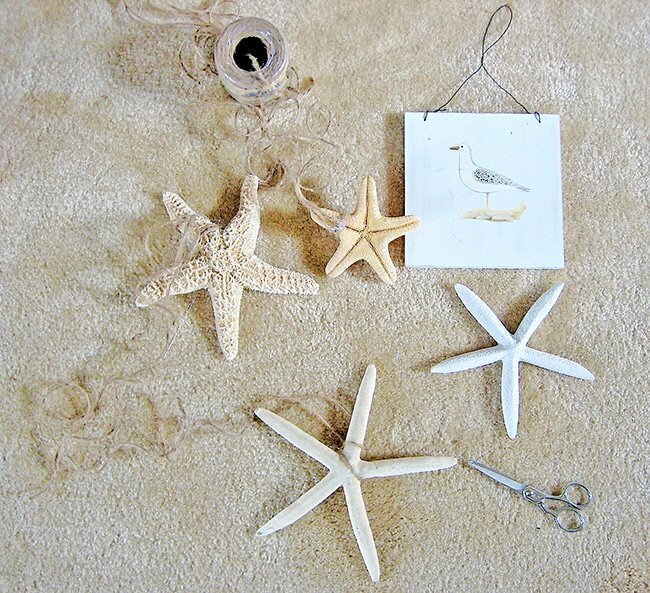 Take randomly sized starfish and tie strings of twine around each of them. Add hot glue the twine to the starfish for strength. Loop a piece of twine across your board and tie the starfish onto it. 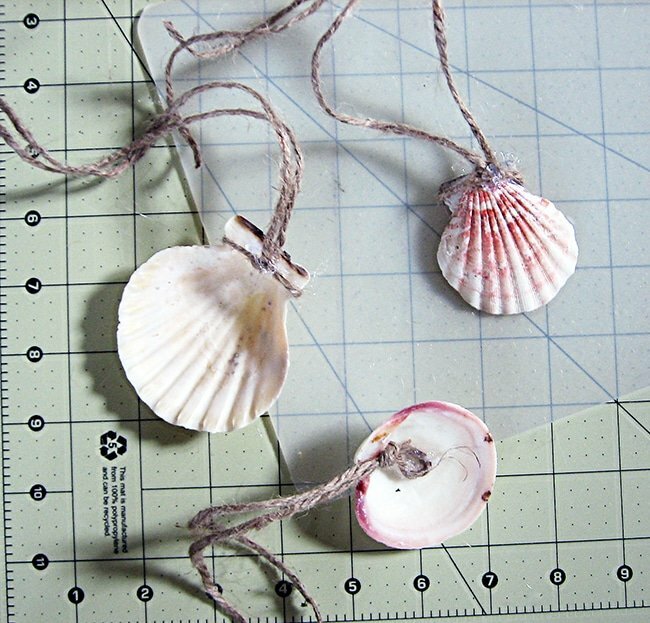 Hot glue twine to scallop shells. Cut a long piece of twine and tie the starfish and shells randomly across the twine. Lopp the garland over the wall hanging. Find a great wide mouth jar and fill it with sand then add random shells. And that’s it! I love this! We have tons of seashells and I have been looking for a way to display them! This is super pretty! I love the seashells. This is really pretty. I bet it’s so relaxing now in your bedroom. Thanks for sharing at Terrific Tuesdays. Very pretty, Kim! I love the little something you whipped up with the leftovers too! Now I’m dreaming of the beach! Great vignette! Thanks for linking up. You are featured this week on Busy Monday at A Pinch of Joy! Hope you will stop by and grab a Featured Button. Can’t wait to see what other project you’ve been working on — hope you will link again soon! 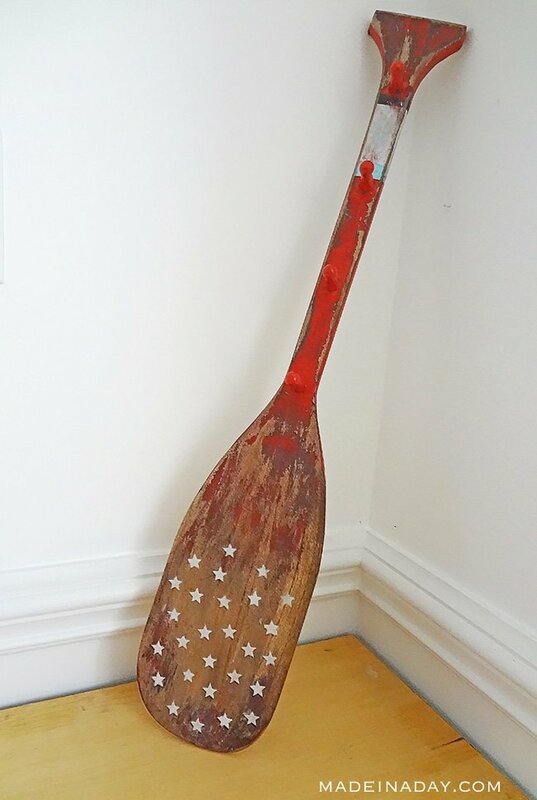 Beautiful — makes me want to go and dig out all of my summer decorations now! It looks fabulous! The whole vignette looks beautiful! Thanks so much for linking up to The Creative Spark. I’ll be featuring this tomorrow. Enjoy your Sunday! I can hear the waves, feel the wind and smell the salt air. I love anything that reminds me of the beach. Thanks for taking me to the beach!!! I came over from the Potpourri Party. I really enjoyed visiting your blog. I look forward to following along as a new Linky Follower. This is so great! I love coastal theme decor! Would LOVe to have you share this at my party that is still going on! I hope to see you there! I love this – Sanibel Island is one of my favorite places on this earth and it is the sea shell capital of the world! So I LOVE sea shells. You did a great job. I may have to copy this. Glad I found you. Such a great idea for shells and such you might collect from a beach vacation, too! Love this! Looks great! I would love for you to stop by my Creative Inspirations party to link up your project! I would love to have you there! The party is happening NOW! Someone in waiting for the summer:) … but it will be here in no time at all! The vignette is wonderfully delicate, but what I love most of all is the seagull little picture! WOW Kim!!! This is amazing! My Mom has a starfish themed bathroom. I’m going to show her your post! Thanks for sharing this at The DIY Dreamer – From Dream To Reality! you just made me dream of our next beach vacation! this looks lovely, maybe i should give our guest room a beach theme! really cool…makes me think about summer vacation and happy times!! 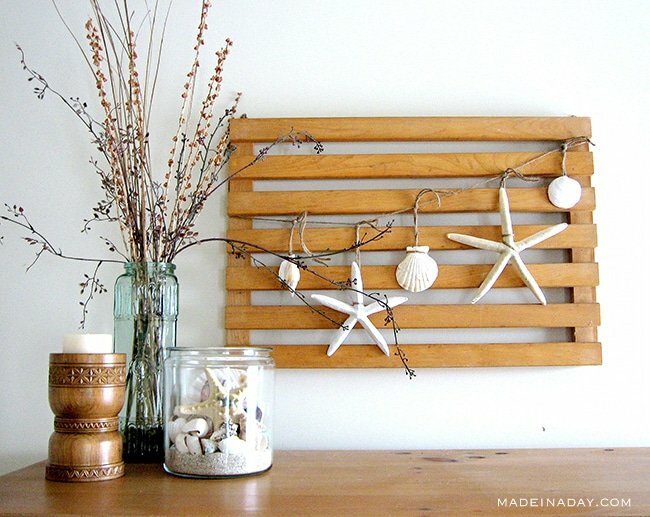 Your reclaimed wood grill type thing display makes a gorgeous picture! I am a new follower via Linky. Love it all! So easy yet so lovely! You make the best stuff! Thanks for sharing it. Saw you over at The Gunny Sack. I’m already a follower. Super cute! I have a bunch of starfish my in-laws found that I need to do something with soon! 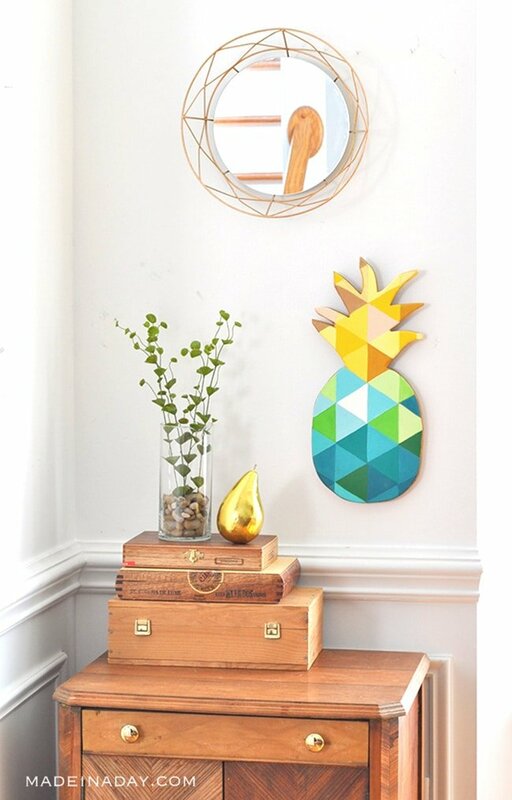 This would work for me since our bedroom is already a beachy theme!